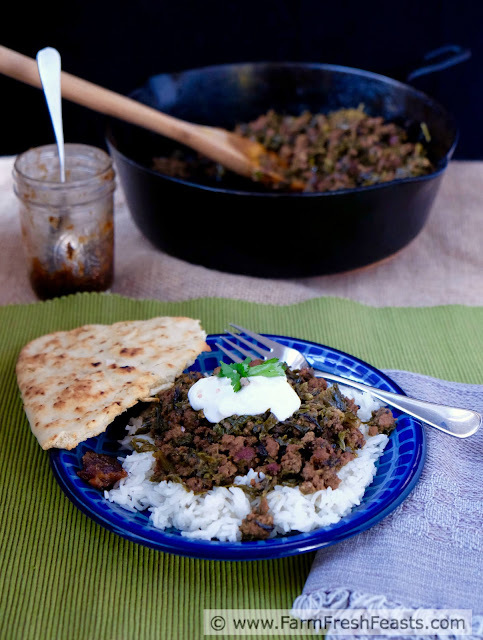 Ground beef and a whole bunch of mustard greens magically transformed into an Indian-spiced main dish the whole family enjoyed. I've been calling myself a seasonal eater for many years now, since I embraced the concept of eating locally from the Community Supported Agriculture (CSA) farm share. I've recently realized that's not entirely true. A more accurate label would be I am a weather-dependent eater. While I do eat locally [as in, you won't find fresh tomatoes or fresh berries in my house unless they came from the garden, the farm share or the farmer's market because I like food that tastes good] I don't care what season we're supposed to be in. What matters more is what it feels like when I step outside with the dogs each day. Menu plans get tossed out the window if the weather is not as expected. Let's take the other day, the first of June, as a prime example. According to the guy on public radio it's the 37th Week of Middle Spring or something and I planned to use up the rest of my son's birthday dinner--steak, potatoes and Bernaise sauce--in an omelette with a side salad from the farm share. Sounds like a lovely Spring meal, no? Except June dawned cold and rainy, not omelette and salad weather. We turned the steak into beef stroganoff instead. I am a weather-dependent eater. This recipe works for a wide climate range which makes sense because we eat Indian food year round. 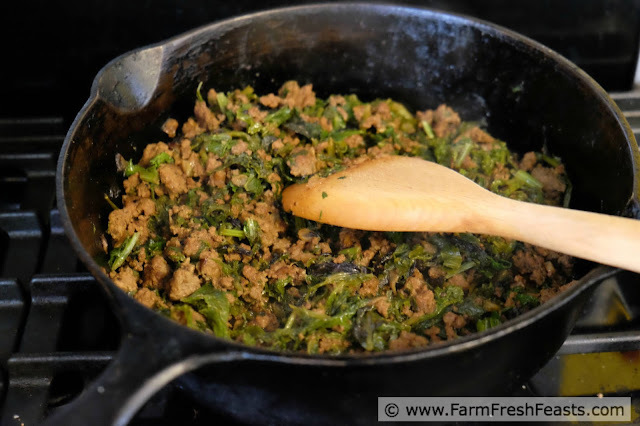 Last Fall I asked my friend Laura, author of The Spiced Life, for a recipe to use both ground beef [from the cow in the freezer] and mustard greens from the farm share. She sent me to her Kheema with Springtime Greens. My spice cabinet is not as extensive as Laura's and I wanted to just throw everything in the skillet, so I had to modify. It looks like a giant skillet of mustard greens--but cover and wait! Last week I posted an easy vegetarian recipe for using your farm share greens--Artichoke & Arugula Pesto Burrata Pasta. A year or so ago I posted an even easier vegetarian recipe--Squash, Mustard Greens and Chick Pea Masala. I'm ready to share a more involved recipe. While it does have the extensive spice list of Indian food at home, it's also a one pot meal (ok, rice cooker = second pot). 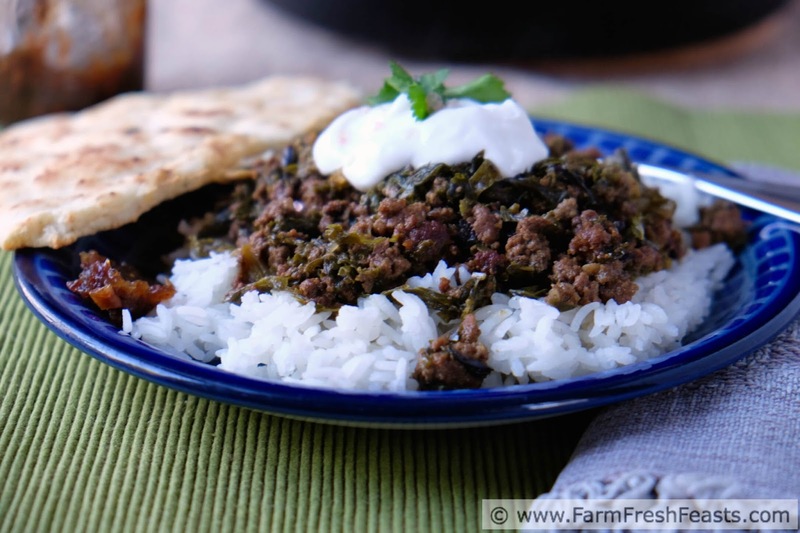 My kids liked both the near uniform texture of the meat + greens as well as the familiar flavors of their favorite Indian foods. I liked getting rid of an entire bag of mustard greens in one swoop. Do you see how much this cooks down? Shown before adding yogurt. For more recipes using Mustard Greens, please see my Mustard Greens Recipe Collection, part of the Visual Recipe Index by Ingredient. For more recipes using ground beef, please check out my round up of 106 Food Blogger Recipes Using Ground Beef. I've got a Greens board on Pinterest where I'm pinning interesting recipes I find around the web, and I also share some on my FB page. Not shown in the photo, but visible in the prepared dish daintily scattered across the Greek yogurt, are the finger limes I got from Melissa's Produce. They were fun to use in this dish! In a large skillet with a lid (I used my 10 inch cast iron chicken fryer) over medium high heat, melt oil and butter. Add mustard seeds and cook a moment or so until they snap crackle and pop, then stir in 1 teaspoon ground cumin and reduce heat to medium. Add onion with ½ teaspoon salt and sauté 5 minutes until the onion starts to soften, then add in ginger and garlic and continue cooking until fully softened, another 5 to 8 minutes. Add remaining ½ teaspoon cumin, coriander, paprika and turmeric and stir until spices are fragrant and incorporated with the onions. Dump in ground beef and remaining ½ teaspoon salt, stir to combine, and cook until ground beef is nearly all browned--stirring to break up clumps and keep everything evenly sized. Rinse the mustard greens and cilantro leaves and dump the still-wet greens on top of the nearly cooked ground beef-onion mixture, then cover and walk away for 3 minutes. Lift the lid, stir to incorporate the greens a bit, cover and walk away for another 2-3 minutes. At this point the greens should be wilted down as shown above. Add the garam masala, yogurt, brown sugar and lime and stir to combine. Taste and see if you need more salt. Serve with rice, naan, yogurt, and chutney--and top with flourish of finger limes. Loving al the spices here Kirsten, definitely my type of meal!!!! I'll admit long spice lists scare me, but the end result is just too good so I press on. I haven't made kheema. I don't know why. We have very similar food philosophies. If it is hot, I want something cold and when it is cold, I want something hot. My husband would be happy to eat a hot meal every single day for every meal, especially when it is his comfort food, Indian. I think one of the few drawbacks of eating seasonally is the rare warm winter day or cool late summer day where you'd planned to have ____________, but the weather makes you want something completely different. 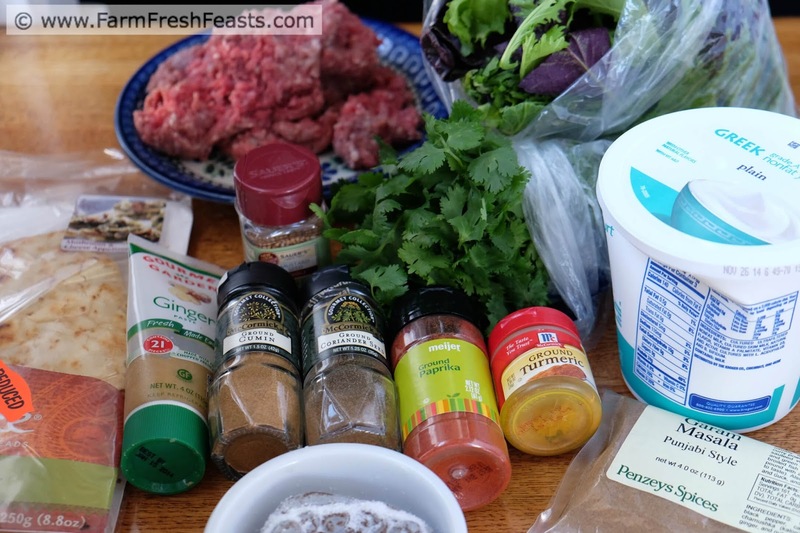 I LOVE kheema and this recipe looks especially amazing. I'm a weather-dependent eater too, so this post really resonated with me. I'm glad to write something that resonates--it's nice to be in company with other fellow seasonal eaters! We LOVE Indian food over here but I have never made kheema! I always have some cow in my freezer, too ... and since I've also got bunches of greens everywhere these days, this recipe looks absolutely perfect! It's a first world problem, always having some cow in the freezer. I realize. My son's cholesterol numbers are not quite what they should be, and the nutritionist advised him to eat less beef--but when your main prepaid protein source is the cow in the freezer . . . I'm working on ways to stretch that 3 ounce serving over a couple of meals, and supporting him eating vegetarian for breakfast and lunch to help balance it out. 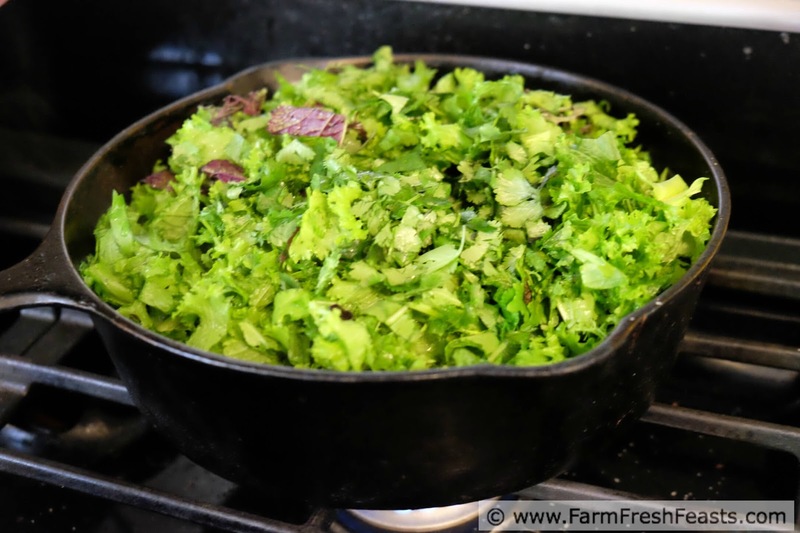 I have a ton of mustard greens coming up in the garden, I'll have to try this! Lucky you! I had terrific success with chard my first 2 years of gardening here in Ohio. A mild winter meant that when I pulled the 2 year old chard up the following year, the root was as big around as my forearm. Subsequent attempts--arugula tucked into the strawberry patch by my visiting mom, spinach because I love it so--just never did as well. I've been layering compost, leaves, coffee grounds and worm castings on my raised beds every time we get a break in the weather, so I am hopeful that I've got my beds as ready to grow this spring. Gardeners always have to have hope. And a stable of recipes--Mustard Greens Pesto is another good one and it freezes well. We picked up the first CSA of the season last night and already destroyed the Swiss Chard. The Bok Choy will be a little tougher, although I'm hopefully to get it knocked out before next week's pick up. Ahhh the joys of the beginning of the season where we feel all fresh and new. I ate a winter salad of boiled potatoes, carrots, and beets over a bed of purple bok choy leaves and topped with a runny egg. Delicious. It is always a wonderful time, the start of a new year. Thanks for the great recipe. Had a lot of mustard greens, and this went through a lot of them. My 11-year old said I could make this for his birthday, he liked it so much. Wonderful! That's a terrific kid you've got there. I do think if you allow the kids to try a variety of foods, they won't get pigeonholed into "chicken nuggets and mac and cheese". They just need exposure. Thanks for circling back to let me know--I appreciate it!